Application & Usage Western blotting (0.5-4 µg/ml). However, the optimal conditions should be determined individually. 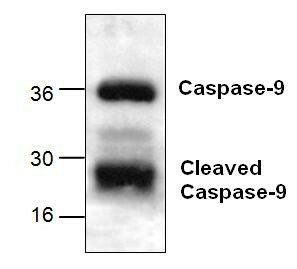 The antibody detects proform (~46 kDa), intermediate (~33-36 kDa), and the fully cleaved (~20-25 kDa) caspase-9.